My nephew was just visiting me and one of his passions of investigating old ruins of houses. We spent the last ten days doing just that, and he has flown out today armed with a few hundred year old coins and some old bottles. 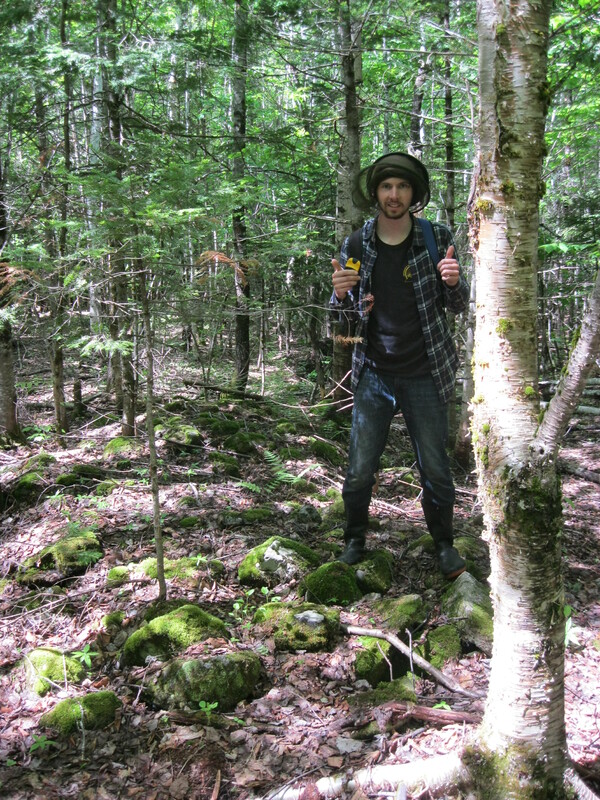 When we were trying to find some of the old farms in what is now forest, I was struck by how little remains. 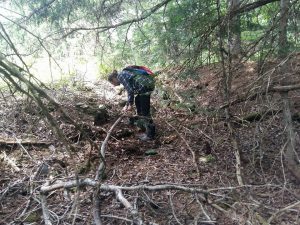 One village we were searching for has been gone a hundred years, and we found little beyond a broken tine off a dump rake and the shattered remains of a cast iron kettle. Another farmhouse, where we spent a few hours yesterday, was a sunken basement with large trees growing out of it, although when I was a child I had crept into the house even as it was falling down and abandoned. This reminder of my mortality comes increasingly often as I get older. When I visit places I had been as a child, or even a young adult when I was able to travel more, they had changed considerably. The roads had been shifted to a more convenient rockcut, and houses had been covered in plastic or disappeared entirely. This is more profound with the old farmhouses. I have traced my fading memory with my nephew, trying to find what had been standing houses, although ruinous, when I was young, only to discover that distances had been elongated, or shortened, that the short distance up the hill was now nearly on the brink of the slope, and that the faded notion of the well had been replaced by weeds and brambles along the slope. On this latest trip I returned often to my memory of the view from the broken windows of the last house we found. I had gone a number of times when I was a child, watching helplessly as the wiring was looted from the walls and people broke out windows to more easily shoot passing animals. The house was located on the opposite hill from the main dirt road, and was accessed by following a precipitous driveway and crossing a small stream where an unsteady bridge afforded the determined adventurer passage, and then walking up the hill past the apple trees on the slope until I stood in the breezes of the hillside below the house beside the lilac at the front gate, and looked back over the pretty valley I had just traversed. It was as beautiful a view as one could hope to see, and more than once I sat on the edge of the rotting well cover and looked over what the farmer and his family must have seen when the land was a working farm. Finding the house this last time was more difficult. The fields have grown up enough that even the slope of the land is hard to recognize. In the distance shrill machinery strove to destroy the remenants of forest, and close at hand we wandered through meadow grass long since gone to golden rod and broom. 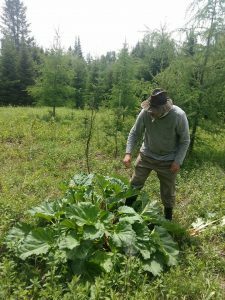 We were circling one likely site, the thick raspberries and blackberries which usually indicate a barn, when I happened upon a patch of rhubarb. 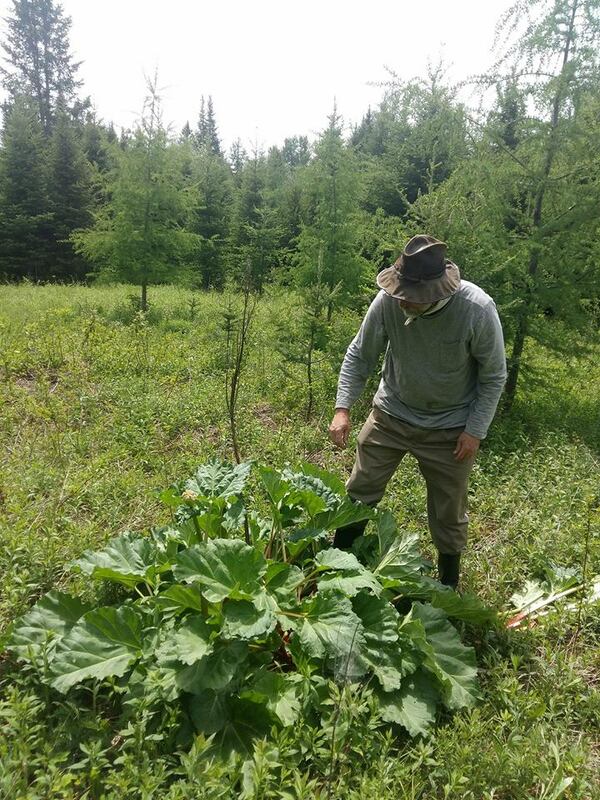 One of the first plants to grow in the spring, rhubarb was treasured for it tart taste and early season vitamin C, and nearly every old farm had a cluster of the thick leaves growing along a fence or near the house. I wasn’t sure I remembered where I had seen rhubarb on the land before, but I was pretty sure it wasn’t too close to the house. I cut some of the rhubarb, which was just as healthy looking as though it had been carefully tended instead of abandoned to its own fate after the homeowners had left the farm, and wrapped it in its own leaves for transport. With our valuable booty, we finally stumbled over the basement, further down the slope from what I remembered, and closer to the tiny bridge. The old road became more apparent too, once we were standing on it and could see straight lines amongst the fractal greenery. My nephew dug into the dirt of the basement while I tried to compare my memory to the piled rock and huge trees in front of me. He located enough broken pottery to convince him of the building’s age, and before long we packed up and returned to the car with a few old square-head nails and a sizable bundle of rhubarb. It’s tempting to see the rhubarb as a symbol of continuity, as an affirmation that life leaves its traces even as we grow older and the world shifts around us. 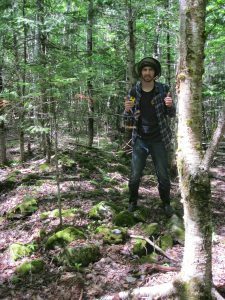 The happy accident of the lingering plant, and the grown wild apple trees like witches brooms reaching above the alders and balsam fir below them, tell me more of a story about the fecund callousness of the natural world. Whether a buttercup seeds in a log or a human skull is a matter of indifference to the flower, and likewise the traces we leave behind us, the stones in the graves we visited, their writing fading as the marble weathers, disappear before the busy hand of time, the memories shifting with the bulging roots until they are as upended as the cemetery stones, a blank testament that someone was here. This entry was posted in History and tagged Abandoned Houses, Archaeology, old farms. Bookmark the permalink.